Apprentice Sarah Louise is a remarkable and capable individual and it is a pleasure to acknowledge her multiple contributions to this paper. If my cult had a Social Director, Apprentice Sarah Louise would meet all requirements for the position. As a social butterfly, she is current on the happenings in the Haute, so it came as no surprise that she knew the theme of the Vigo County Historical Society's New Years event was time travel. 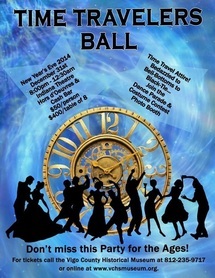 History and time travel: surely, this will be better than last year's debacle whose theme was the "Roaring 20's". If all I knew of the period was what I observed at the dinner, I would only know that there were Gangsters and nothing else. Apprentice Sarah Louise described the poster for the event as "Steam Punk" and intimated that the Society can not distinguish between a time period and a genre. Since I could not recall a period called "Steam Punk" in our timeline, I quickly agreed with her assessment. Local school age children are instructed that "Terre Haute" is French for "High Ground" and, French being French, the adjective comes after the noun. This is known by any student of French (le voiture rouge, the red car). Searching a French/English dictionary will reveal that "terre" is ground and "haute" is high. This will satisfy the majority of inquires into the name of Terre Haute, but for certain individuals, who are aware of the terms "haute cuisine" and "bas relief", this is not a satisfactory explanation of why our wonderful city is called "Terre Haute". The following are all the references to "haute" to the year 1800 that are in the Oxford English Dictionary. 1500a Melusine xlix. (E.E.T.S.) 325 ... and cutte the haulte piece of his harneys. 1500c Melusine (1895) 145 ..and his hawtepyece fell of with the forsaid stroke. 1548 Hall's Vnion: Henry VIII f. lxvv, ...with the highest step, a hautepace of tymber of .xii, ..
1645 J. Howell Epistolæ Ho-elianæ v. xxxviii. 42 He can marinat fish, make gellies, ...and the haugou. 1661a T. Fuller Worthies (1662) Cornw. 194 [Garlick] giving a delicious Hault-gust to most meats they eat. 1670 W. Hughes Compl. Vineyard (ed. 2) 65 A sort of Claret called Hobriant-wine, of a deep red colour. 1684a J. Evelyn Diary anno 1683 (1955) IV. 329 This gent, was owner of that excellent Vignoble of Pontaque & Obrien. 1735 in Etoniana (1865) x. 157 The..hall was fitted with a haut-pas at the upper end, and a chair of state upon it. 1743 W. Ellis London & Country Brewer (ed. 2) II. 97 by giving it a fine Haugust, or a true Tincture of the Malt. 1752 Milton's P.R. i. 344 (note) ... where ambergris is mentioned as the hautgout of that age. 1787 T. Jefferson Memoranda in Papers (1955) XI. 456 Monsieur Mirosmenil..makes 125. tonneaux 3. Hautbrion. We note that in every instance, the adjective "Haute" is before the noun. The following are the first use of "haute" in various senses since the year 1800. 1801 Sporting Mag. 17 22 People of the Haut Ton are about to return to town. 1834 W. Beckford Italy II. 210 ... who entertained us..with many private anecdotes of the haute noblesse. 1850 J. Leitch tr. K. O. Müller Ancient Art (new ed.) §244. 251 Colossal haut~reliefs of imaginary animals. 1864 Mrs. Beeton Jrnl. in N. Spain Mrs. Beeton & her Husband (1948) ii. vi. 215 ... of many of our haute monde [sic]. 1894 Beerbohm in Yellow Bk. III. 253 A certain lack of tone had crept into the amusements of the haut monde. 1943 Mind 52 178 ... in the nature of what the French call an œuvre de haute vulgarisation. 1966 Guardian 25 July 6/2 Simonetta is said to be presenting a much bigger haute boutique collection this season. 1966 Observer 25 Sept. 46/2 An egg-based haute cuisine dinner for 6. Once again, we note that all examples of "haute" occur before the noun being modified. Terre Haute, or more accurately the segment of Wabash Avenue that is north of the courthouse, is located 39 degrees 28 seconds north of the equator. This total of all the seconds (39x60+28) is 2,368. The numerical value of "Jesus Christ" in the Greek alphabet is 2,368. The phrase "and his number is 666" has the value of 2,368 in Greek. The most famous lodging in Terre Haute was the Terre Haute House. It was originally built in the 1840's and was called the Prairie House because there where no trees from the Wabash River to the the bottom of what would become Deming Park. Not surprisingly, I have never read an explanation why there was a forest from the Atlantic Ocean that abruptly stopped at the prairie, only to resume from the Wabash River and continue to the Mississippi River. Fort Harrison was finished in October, 1811 on the north side of the future Terre Haute.. The location, I believe, should have been on higher ground, such as where the courthouse is located. Also, the original settlement of Terre Haute was much further south of the courthouse, where the sewage treatment plant would be located. It seems odd that settlements were established north and south, but not, on the high hill over looking the river. Of course, if the area where the courthouse stands was an island or submerged, I can understand why no fort would be built there. Our current courthouse is the only building to sit on that site and that a tree was removed at "considerable expense". I speculate that when the town was platted in October, 1816 it was was under water was under water or an island, when Fort Harrison was constructed. I suggest that the New Madrid earthquakes of 1811-12 forced the river bottom upwards and the river bed drained . This idea would explain (1) why there were no settlements in Terre Haute proper and (2) the existence of a prairie in the middle of forests. The Oxford English Dictionary has the following obsolete definition for "haut". Etymology: < haut adj. Obs. trans. To raise, elevate, exalt. ?a1400 Arthur 113 He daunted þe proude & hawted þe poure. c1490 Promptorium Parvulorum 230/2 (MS. K.) Hawtyn..(Pynson hawten or heithyn vp), exalto, elevo. 1582 R. Stanyhurst tr. Virgil First Foure Bookes Æneis i. 6 Chiefe stags vpbearing croches high from the antlier hauted. While I agree with our learned colleagues at the historical society and local educators that French settlers explored the midwest, I have grave reservations that these explorers named Terre Haute. I am surprised that the French would not follow French syntax when creating names for this area in Indiana, while they correctly followed syntax for hundreds of locations in North America. We have demonstrated that all loan words from French that contain the adjective "haute" from the years 1460 to 1966 always occur before the modified noun. Because the name "Jesus Christ" and "his number is 666" have the same value, we are unable to determine if Terre Haute should be understood as being dedicated to Christ or the Anti-Christ. If the earthquakes of 1811-12, raised the river bed as I speculate, then it would be reasonable to name the area "Terre Haute", not because it is now "high ground", but because it is "risen ground". Our attempt to understand Terre Haute has resulted in interesting minutiae, tidbits and trivia only. In fine, Terre Haute remains a mystery regardless if we analyze it linguistically, historically, militarily, Christologically, eschatologically or geologically.